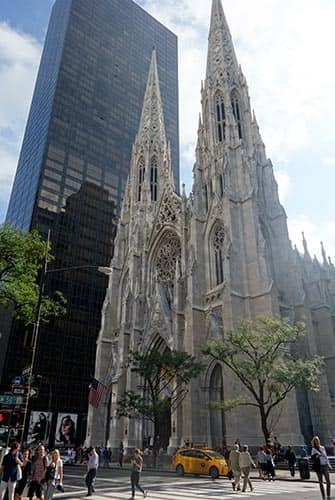 Many consider St. Patrick’s Cathedral in New York to be one of the cities most prominent landmarks. 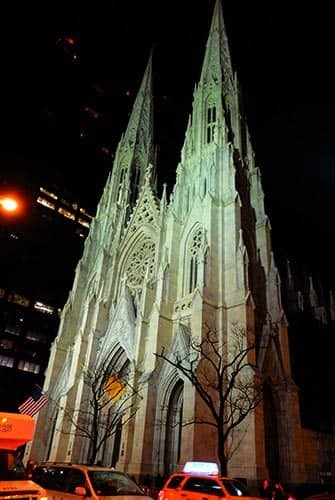 With its central location on Fifth Avenue right across from Rockefeller Center, this massive cathedral is impossible to miss! St. Patrick’s dates back to the 19th Century and is the largest Neo-Gothic cathedral in North America. St. Patrick’s Cathedral’s initial location was on Mulberry Street. However, in 1853 the cathedral became too small to house its growing number of devotees, it became time to move. So commissioner, Archbishop Hughes suggested, that moving Uptown would be the best opportunity for expansion. However, at first this idea was not welcomed. At the time this area was too far away from the city centre. He predicted that this part of town would soon become the heart of the city. It seems like he was right! As a result, the first cornerstone of the cathedral as we know it was laid in 1858. 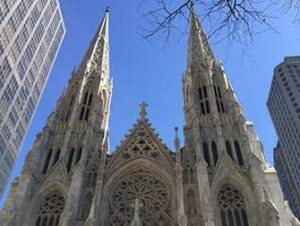 Today Saint Patrick’s Cathedral is located in Midtown, steps away from other New York landmarks including Central Park and Grand Central Terminal. St. Patrick’s Cathedral looks impressive both from the inside and the outside. The doors of the cathedral used to be closed, but nowadays they are kept open for visitors. Go inside and admire the high ceilings, the 3,700 stained glass panels and the replica of Michelangelo’s Pietà (three times larger than the original). There are also artworks made by artisans from all over the world. It can accommodate up to 3,000 people and from the ground to the spires it’s 330 feet tall. 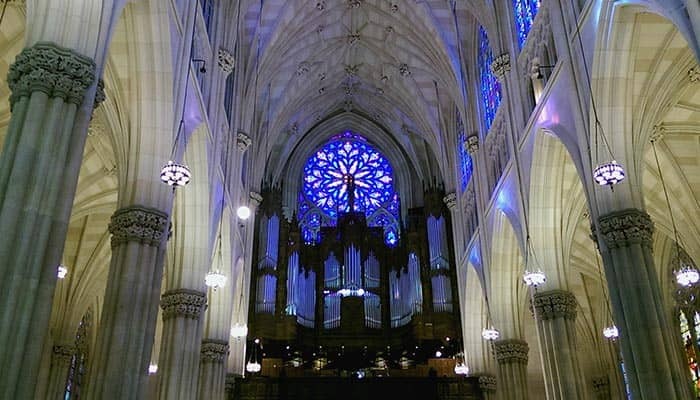 There is a guided tour from Monday to Friday at 10:00 on which you’ll learn more about the architecture and history of St. Patrick’s Cathedral. It’s a free tour, but donations are welcome. Eric’s Tip: What I find most unique about St. Patrick’s is its location. This magnificent building stands in the middle of the hustle and bustle of Fifth Avenue and all the luxurious shops. It’s such a contrast, typical of New York.